Personally, I like cheese-powder covered corn puffs as the little ball shaped treats that Planters used to make that came in a canister. Lately I’ve only been able to find the ball version from the “Utz” brand so I just went with these products. But if anyone knows of another brand of cheese balls (sold in New England or if you could send me some from the outside) feel free to let me know. These had a very cheesy smell when we opened the bag, which is always nice – especially when the product claims to be made with real cheese. It’s worth noting though that the scent of cheese was stronger than the actual taste of cheese. The Doodle had a satisfying crunch and a light and airy texture. One of the most important features in a product like this is “meltability” which is when the puff nicely compresses as the tongue smooshes it against the roof of the mouth. Ethan and I both agreed it excelled in meltability. These did not have as strong a cheese scent when we opened the bag. The outside texture is somewhat crustier but the over all taste is slightly buttery, which is always a welcomed flavor 🙂 The cheese flavor was okay, I think slightly better because of the butter undertone but other than that, not much different. These were also more dense than Doodles and that did have an effect on it’s meltability – they were harder to compress in the mouth. I’d give it to Cheeze Doodles for it’s meltability, which is what I look forward to with these types of treats, but if you don’t care about that then you might be more inclined to go with Cheetos for the slightly better flavor. Ethan thought both where fine but was a fan of the Planter’s version so neither was a replacement for that. In case anyone is wondering, I will conduct a re-match in the future with Cheez Doodles and Jax. Cheez Doodles or Cheetos Puffs? FWIW: there’s an online petition asking Planters to bring back Cheez Balls. Cheetos wins simply because the eye on the Wise bag gave me the creeps as a child. You have not lived until you’ve had Gibble’s brand cheese doodles/curls/puffs. Manna from heaven. Not too salty, but deliciously cheesy! I was addicted to those Planter’s Cheese Balls as a kid, and it gave my mother no end of grief to keep my cheeks stuffed with them. However, not long ago, I walked into a local Walgreens and saw a HUGE plastic barrel filled with generic cheese balls. I was in a big rush so I didn’t grab them, but I can if need be. Oh, and Cheetos all the way! Not quite on-topic, but I wondered for many years why no cheese even approximated the taste of various cheese-flavored products like these. I still wonder, but some years ago for a short time the area supermaket (Stop&Shop – specifically one in Quincy MA circa 1986) had it! Available on-line but very expensive (and be careful of US versions, some of their own writeups admit they are nothing like the UK version). I was also once addicted to Planter’s cheese balls. I have recently found an Albertson’s in north Texas that carries Fisher’s cheese balls in a canister. They are a worthy substitute and are only a dollar a can! I crave cheese puffs often, yet hate how they stick to my teeth. Have just returned to Australia from a US holiday and I am going into Cheeze doodle withdrawal!!!! Does ANYONE know if they can be purchased here???? All Wise products taste better to me than their competetor. Maybe because they seem more fatty. I haven’t seen them in KS & when I visited my sister in New York I devoured the whole bag of cheez doodles. Cheeze doodles are number 1!!! I get them all the time here in NY, Long island more specifically. I’m not a fan of the cheese puffs. Every since I was about seven or eight, I would always devour a whole big bag of the cheetos puffs or balls. 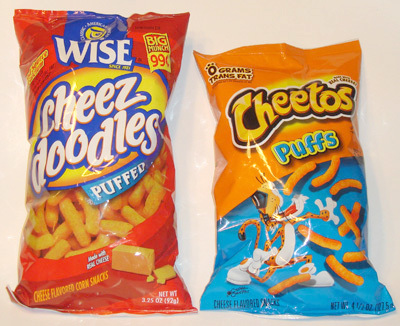 I still eat the puffs but unfortunately, years ago, cheetos stopped selling the cheez balls. They do now have cheetos giant which is kinda like the balls. I was also addicted to the planters cheez balls and curls, now that those aren’t sold anymore, I buy the generic cheese balls. I can easily dust a big bag of these cheese flavored snacks in minutes. I hate then they get stuck in my teeth and my fingers get very orange from the cheese though. Did you used to be another company name? You know Cheetos are full of MSG, I have to eat them with Advil. I have tried all cheese puffs…..Snyders, Giant Eagle, Troyer Farms, Cheetos, and Wise cheeze doodles. Wise cheeze doodles puffed are by far the worst as far as taste. Where is the cheese you supposedly put on the product? I don’t think I’ll ever purchase Wise again. Snyders is the best and the taste continues downward as listed above. Unless I’m desperate, I might have to discard the bag of Wise cheez doodles I have on hand. It’s almost a full bag. I think there are these giant Cheetos cheese balls available here. The picture title “Cheetos Puffs” is in fact a regular cheeto not one of the puffed variety….your shananigans dont work on me! For people who love Cheez Doodles, try Price Rite store brand, cheese flavored, puffed curls. OMG! These are cheezy, salty, soft and puffy pieces of junkfood goodness! And the price is rite!!!! Half or less than the competition! I can’t believe I can walk on the gross cheezy wild side for so little money! I nearly caved and bought Chesters, which are addictive to folks who love Cheez Doodles, and which cost $2 or less, but I bit the bullet and tried something even cheaper, and probably less healthy (but whose counting).